The Best Picture Oscar-winner will finally be available on Blu-ray at the end of the month. 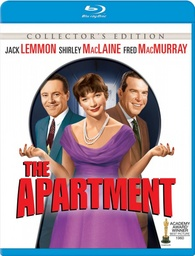 As previously reported, MGM/UA was going to be bringing 'The Apartment (1960)' to Blu-ray on September 13, but now the new date looks to be January 24. Winner of five 1960 Academy Awards®, including Best Picture, 'The Apartment' is legendary director Billy Wilder at his most scathing and satirical best. With audio commentary from film producer and AFI member Bruce Block and two featurettes— including a loving tribute to actor Jack Lemmon—this special Collector’s Edition is your chance to own one of "the finest comedies Hollywood has turned out" (Newsweek)! You can find the latest specs for 'The Apartment (1960)' linked from our Blu-ray Release Schedule, where it's now indexed under January 24.